Nepal is vegetarian heaven. From huge chow meins, to aromatic curries, to tasty momos (dumplings), almost all dishes are available in both meat and vegetable form. In fact, for vegetarians who are used to only having two or three options on a menu, the choice can be a bit overwhelming! An entire encyclopaedia could be written about the range of vegetarian food in Nepal, but I’ve done my best to condense it to the bare essentials. A veggie breakfast in Nepal will typically be a roti (flat bread) with some vegetables or aloo (potato), though bakeries serving incredible pastries are common in the cities. Restaurants may also serve pancakes and omelettes. 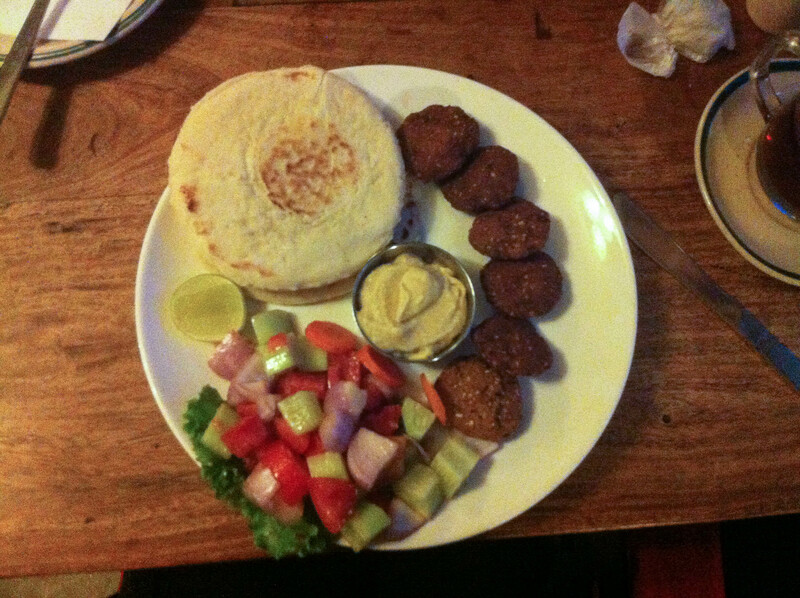 A typical vegetarian meal, particularly if you are outside the bigger cities, will consist of rice, spiced vegetables and potato, and a side of dhal (lentil soup). Chow mein (vegetables and noodles) is also a common dish. Vegetarian-friendly, vegan-friendly, and pretty tasty too! 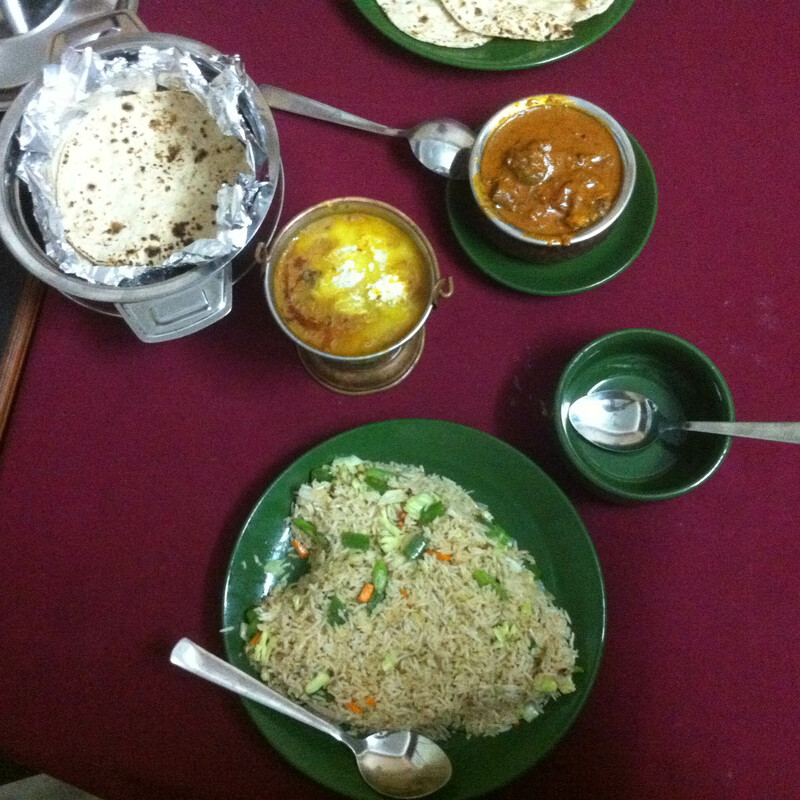 While curries are usually seen as an Indian staple, they are widely available throughout Nepal, too. Most curries come with a choice between meat, vegetables, or paneer (cubes of semi-soft cheese that aren’t much on their own, but make a delicious and filling addition to a curry). Some dishes, such as sandheko (a dry, spiced vegetable dish), may also have the option of peanut or mushroom. Potato (Aloo) dishes are also widely available. Most menus will have a description next to each item on the menu, so don’t worry about memorising a lot of different curry names! 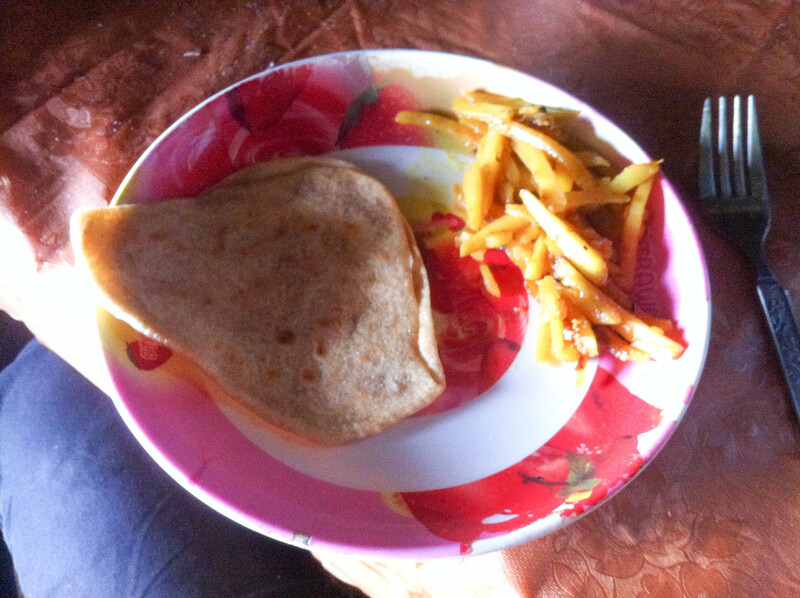 Roti: A plain flour and water pancake. Paratha: Similar to a roti, but fried, and stuffed with a choice of vegetables or potato. Naan: a thicker bread with optional toppings of butter, garlic, or cheese. Curries won’t come with rice unless you order it. The options are usually: Plain rice (boiled), fried rice (fried in butter or oil, not egg), or vegetable biryani (flavoured rice and veg- a meal in itself). 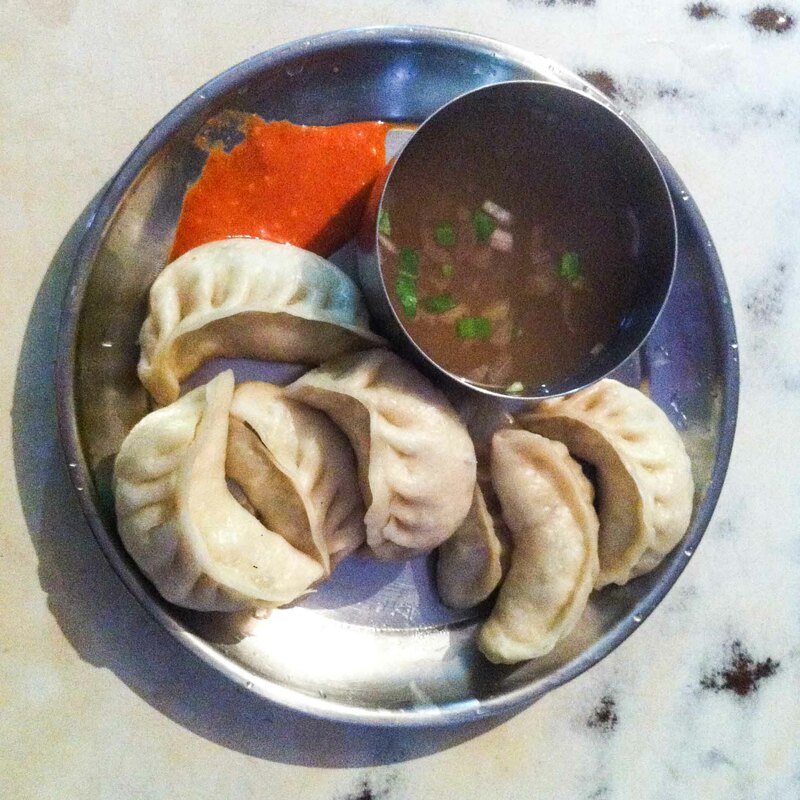 Momos are everywhere in Nepal, and are surprisingly tasty. These are dumplings with a range of fillings (usually meat, vegetables, or cheese), that are either steamed, fried or kothay (fried on one side). Vegans should check whether their momos will be fried in butter or oil. Other veggie sides and appetisers include pakora (battered and deep fried vegetables) and chilli vegetables/potato/mushrooms. 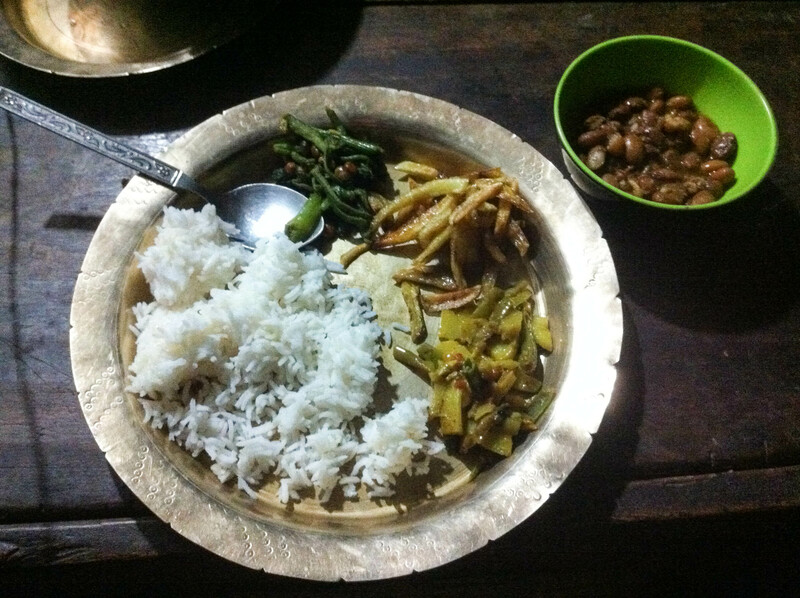 Soup in Nepal is often a meal in itself. In addition to dhal, a good option for a light meal is thukpa, a vegetable soup filled with thick noodles. For those who want a break from Nepalese dishes, there are plenty of choices. Pizza and pasta are readily available, as are veggie burgers and fries. In the larger cities, you’ll also be able to find anything from burritos to falafels. Vegans are catered for in Nepal, though they need to keep an eye out for certain ingredients. Paneer, of course, is off the menu. Butter or ghee (clarified butter) often turns up in curry sauces, as does cream. Yoghurt also makes appearances in items such as tandoori paste and naan bread. While there will almost certainly be a dish available that meets your needs, if in doubt, it’s best just to ask. I consider myself a spice-lover. In the West, that is. Out here the definiton is very different. Even dishes such as tikka masala, which I would consider back home to be the blandest of sauces, can be pretty spicy here! But that’s all part of the joy of trying new foods, so be brave, try a new dish, and make sure to order plenty of bread and water (or even better, milk) if things take a turn for the hot! If you are really spice-phobic, it might be best to ask for your meal to be made non-spicy, though keep in mind that may also have a different definition than it does in the West. In addition to a range of soft drinks (Coke, Fanta, Sprite, etc. ), Nepali restaurants offer delicious milkshakes (made with actual milk, not ice cream), fruit juices, and lhassi (a yoghurt drink available with different fruits). As a visitor to Nepal, it’s safest to stick to bottled water, or to bring a filter bottle or purification tablets with you. You should also be wary of ice. While some restaurants use purified water to make ice, many do not. It’s often best to ask, or to just remove the ice from your drink before it melts. Nepalis are fond of their tea, which is usually served with sugar and no milk. 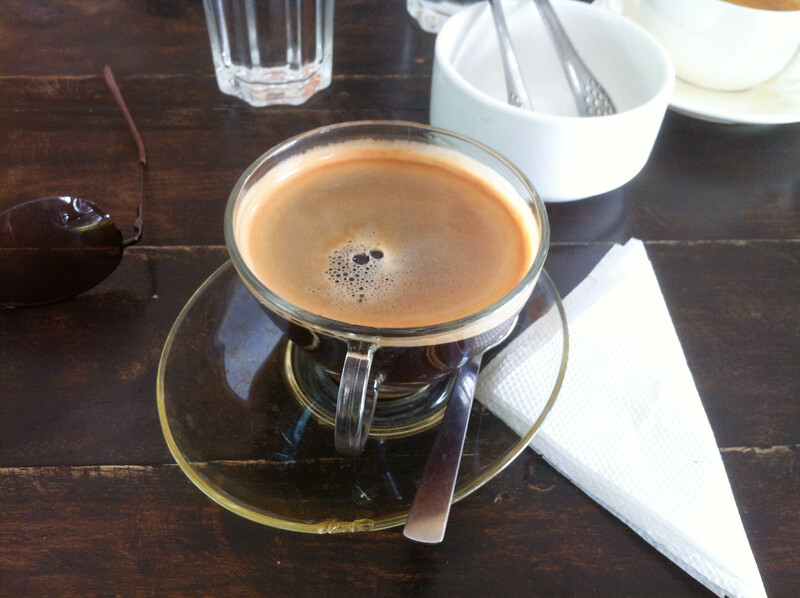 Himalayan coffee can be excellent, particularly in Kathmandu. Most offer the full range of cappuccinos, lattes, macchiatos etc, though sometimes you can’t beat a fresh brewed cup of filter coffee (milk costs extra). For something stronger, try a local beer such as Ghorka or Everest. Wine and cocktails are also available, though they can be pretty expensive. Roksi, a home brewed millet wine, is the drink of choice in the mountains, though it tastes more like a spirit than a wine, and can take some getting used to! Desserts aren’t an essential part of Nepali meal, though restaurants may offer fruit, ice cream, or chocolate desserts. It is perfectly safe and hygienic to eat as the locals do in Nepal. While upset tummies are an unavoidable part of travel, you can minimise the risk by avoiding uncooked food, as well as water or ice that isn’t purified. Frequent electricity cuts are common in parts of the country, so ice cream should be avoided as it may have thawed and refrozen. 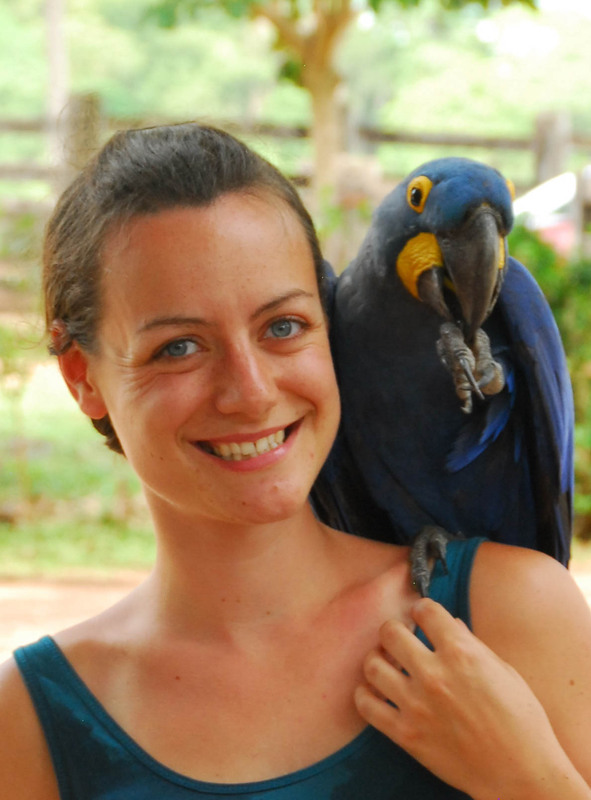 Keep an open mind, keep an adventurous appetite, (keep an Imodium handy, just in case), and enjoy sampling all the tasty dishes Nepal has to offer! mmm interesting – this piece of writing reminds me there is a good Nepalese resturant in the Fulham Road, London just near the junction with Munster Road – in London SW6 where I lived for years, and also I think there is one nearby now in Bognor Regis – must visit. You are showing interesting things about Nepal to someone like myself who has only known some things. Nice writing and pics and blogging. at least 20 pieces of momos a day. i am a huge fan of it. I’ve just left Nepal and I already miss them! Oh yeah it is so tempting, did you try the Everest Momo near Thamel?? can’t stop myself to go there and eat everyday. But because of the crisis in Nepal it is about to be closed temporarily. M gonna miss it too. Can’t remember Everest Momo, but I did like Momo Hut!